In 2014, 141,000 motorists were involved in a head-on collision, reports the U.S. National Highway Traffic Safety Administration. These crashes resulted in nearly 2,900 driver/passenger deaths and 62,000 serious injuries. The sheer physics of a head-on impact makes this one of the most dangerous types of vehicle accidents, often resulting in catastrophic physical injury or death. National statistics suggest that most head-on collisions result from negligence. In some accidents, the driver falls asleep behind the wheel, is driving too fast on a sharp curve, or is distracted. Other factors such as excessive speed and drunk driving may contribute as well. If you or someone you love has been harmed in a head-on crash caused by another driver’s negligence, you may have a claim for monetary damages. At the Louisiana personal injury law firm of Bart Bernard, our highly credentialed attorneys will help you fight for maximum compensation. A head-on crash, also known as a frontal collision, occurs when a motor vehicle strikes the front-end of an approaching vehicle. This usually takes place when one motorist crosses over a median or center line into oncoming traffic, or attempts to pass another car on a two-lane road. Wrong-way driving, where a motorist travels in the wrong lane – either unknowingly or on purpose – may also result in a head-on collision. What causes a head on crash? According to recent head on collision statistics, a mere six percent of crashes are caused by drivers attempting to pass another vehicle at inopportune times. Excess speed on curves accounted for 20 percent of head-on collisions, while the vast majority – 63 percent—are attributed to distracted driving (talking on a cell phone and drifting into the opposite lane, changing music, etc.) and reckless driving. Given the tremendous force of a head-on crash between two metal vehicles, passengers and drivers are often subject to life-threatening harm. In Louisiana, there were 737 motor vehicle accident deaths in 2014. At least 73 of these fatalities are likely attributed to the mortal nature of head-on accident injuries, according to national statistics. When two vehicles collide head-on, motorists are not only jostled from the force of the impact, they are exposed to jagged metal protruding in the passenger compartment, as well as shards of glass from the windshield. Research indicates that motorists can increase their odds of surviving a head-on crash by as much as 60 percent by wearing their seat belts and driving a vehicle that is equipped with frontal airbags. Head on collisions: who can be sued? There are various parties that may be held liable in a head-on car crash. If a motorist crosses a dividing line or median before hitting another vehicle head-on, he or she may be held responsible for all property damage and injuries if evidence of alcohol use, excessive speed or distracted driving exists. Likewise, drivers who fail to obey traffic laws, such as passing on a double line, or drinking and driving, are likely to be found at-fault for the accident. If the motorist who was hit was also violating traffic laws or driving negligently at the time of the crash, both parties may be held partially liable. Because head-on crashes, even at slower speeds, are devastating accidents, they are more likely to cause serious damages. The more damages are realized, the higher value of the claim. Insurance companies, however, are unlikely to offer fair compensation, and may attempt a low-ball settlement of a few thousand dollars to keep the case out of the courtroom. Before signing any agreements, speak with an experienced car accident lawyer who can outline the true value of your claim. Louisiana attorney Bart Bernard has the resources and legal acumen to fight for the highest settlement possible. Civil litigation filed after a head-on collision seeks to recoup both economic and non-economic losses sustained by the victim(s). In the wake of any type of traffic accident, personal injury or wrongful death, you want an aggressive legal advocate on your side: a team of skilled trial lawyers, litigators and staff that can achieve justice on your behalf. 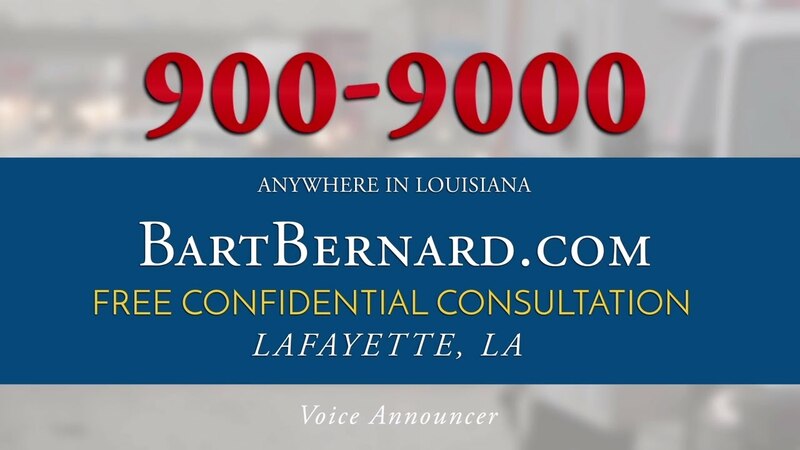 The personal injury firm of Bart Bernard has been helping victims throughout Lake Charles, Baton Rouge and Lafayette for more than 20 years. Put our experience to work for you. Call to schedule a free, no-obligation case review today.